This past weekend, Kelli and I snuck away to Wyoming’s Snowy Range, southwest of Laramie, for a relaxing getaway. As I mentioned in our inaugural post, I’m a writer. Some of that writing covers food and drink, but I also do a lot of travel and adventure writing. Within the adventure genre, some of that writing is experiential, where magazines send me on assignment to do something crazy or interesting and write about it. Lately, that experiential adventure schedule has gotten quite busy – climbing a desert rock spire near the CO-UT border for one magazine, climbing Colorado’s hardest fourteen-thousand-foot mountain for another, caving in Colorado’s deepest and most dangerous cave for a third. Combine that with upcoming trips to NY, NH and Mexico, and it felt like the summer was slipping away from me! Which brought Kelli and me to Wyoming. My personal passion is for the mountains – mountaineering, rock and ice climbing, camping, backcountry skiing. When I get a free moment, the high country is where I love to be. Fortunately, Kelli feels much the same way. So we packed up the Jeep and laid a course for the Snowy Range. We climbed 12,013′ Medicine Bow Peak on Saturday, and 11,722′ Browns Peak on Sunday. 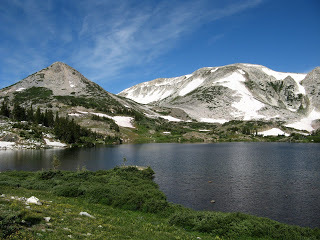 You can see photo galleries from our hikes on my website – just visit the News page and check the announcement for today (7/28/08), or visit the Mountains page of the Adventure section and scroll down to Wyoming. Adjusting our diet to be gluten-free in the backcountry was a relatively easy transition. It used to (pre-gluten-free) involve chewy granola bars, a rotation of candy bars, jerky, as well as some of the freeze-dried dinners in Mountain House’s Pro Pack line. Now it involves lots of fresh fruits and vegetables, dried fruits, peanut butter, GF meats, and a couple of specialty GF energy bars. 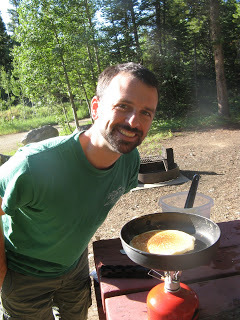 Of course, when you’re cooking breakfast or dinner on the campfire (or camp stove), you want a meal that’s a bit more hearty. This past weekend, we made GF pancakes for breakfast on Saturday morning. We only had our small backpacking stove and pan, so we cooked them one at a time, but it was worth it! They were delicious! This time around, we used a gluten-free flour mix from Deby’s Gluten Free, a bakery in Denver, Colorado. We combined the dry ingredients (including Deby’s GF flour) and the wet ingredients (separately), and kept them chilled on ice in a cooler until Saturday morning. Then we mixed the goods and made the pancakes. Sunday morning we made bacon and egg omelets for breakfast. I should have taken a picture of the omelet, but I was so hungry, and it tasted so good, that I gobbled it down before I thought about snapping a photo. For the bacon, I use Hormel’s Black Label, which is gluten-free. You can see a list of Hormel’s entire line of GF foods here. Finally, the weekend left me with a new goal: to create the perfect GF graham cracker. 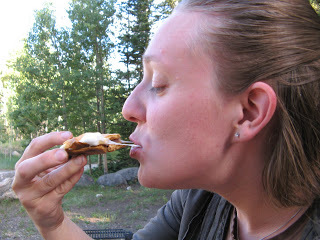 On Saturday night by the campfire, Kelli made the almost-perfect Smore. It was not quite perfect because she used standard graham crackers from the grocery store, which were strictly off limits for me. But the Smore looked and smelled delicious, so stay tuned – we’re heading into our test kitchen (also known as our kitchen) to create a GF graham cracker. Oh my, I just discovered your blog and hope that you really are trying to come up with a GF graham cracker recipe. I have a wonderful apple crisp recipe that calls for graham crackers and it would be wonderful to make it again! Am putting your cookbook on my Christmas wish list.